FABULOUS book haul!! I'm so jealous of your copy of Beautiful Disaster! I read an e-ARC but I feel like I NEED A PHYSICAL COPY!!! It's just that good!! I haven't actually read Incarnate but I've seen it everywhere! I feel like I must be missing out! 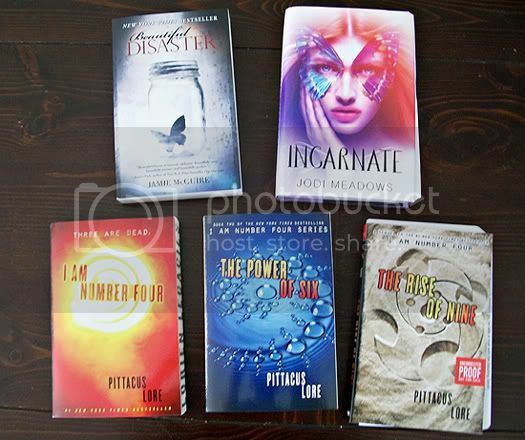 I also got the Pittacus Lore books this week as well. Great haul. Come visit me as well. While I wasn't the biggest fan of the first Pitticus Lore book, the boy students I passed it on to were thrilled. I'll be interested to hear what you think of all three. Ooh nice! Haven't read the Pittacus Lore books either, but hope you enjoy them all! Oohh Beautiful Disaster and Incarnate! I can't wait to read them! I have Beautiful Disaster, but I still need to get a copy of Incarnate. And I've heard awesome things about the I Am Number Four Series. I am definitely interested in the I am Number Four series. My students loved the first book and were passing it around all school year. Enjoy all of your books! Oooo, I still need to read Incarnate. I've heard mostly good things about it. I got the Pittacus Lore books too, I've only read I Am Number Four though, have not even started the other two. I hope they are action packed and fun reads though. I got Beautiful Disaster last week, I'm looking forward to reading it because I've read lots of mixed reviews. I got Beautiful Disaster this week too. Hope you enjoy. I got the Pittacus Lore books, too. And I think I'm going to pick up a copy of Incarnate when it drops in paperback! I've been wanting to read it. Incarnate, I need to read that one ^^ Great haul!